If you’re running a business with a digital presence there’s a good chance you’ve heard of Lead Pages or Optimize Press before. Both are well-established. Both are providers of tools and templates for landing pages, sales funnels, membership portals, etc. Both claim to increase the ROI of your business. However, there is a new(ish) kid on the block when it comes to meeting the marketing and sales demands of digital business: Click Funnels. Though I only recently discovered Click Funnels, I am already super-excited to be talking to you about it for a variety of reasons, not the least of which is cost. As you know, maximizing the efficiency of dollars and cents is at the core of everything I do. Unlike Lead Pages or Optimize Press where funnel templates come with differing costs and differing features, Click Funnels’ functionality is nottied to price. All the tools, tricks and utilities of their templates are included with the basic $97 per month Start-Up package (yes, they do have a more expensive Enterprise package, but it does not come with additional functions). More importantly, Click Funnels’ templates are completely customizable. While Lead Pages, Optimize Press and Click Funnels all come with a certain number of prefabricated templates, only Click Funnels allows for the development of fully-customizable templates, which is a huge advantage if you’re looking to have a landing page, optin or membership portal that is unique to your business. As a self-described integration-pro, there’s no way I can avoid mentioning how easily Click Funnels syncs with your favorite programs. 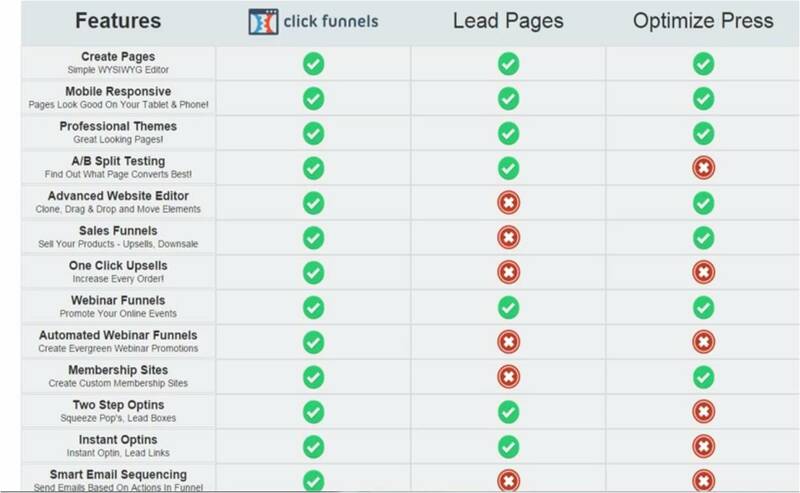 From auto-responders and shopping carts (like GetResponse and Stripe) to marketing automation software (like Infusionsoft), Click Funnels is considerably more pro-integration than Lead Pages or Optimize Press. Click Funnels is so good that – in some instances – you should probably use it instead of Infusionsoft…And you know if I’m recommending something over Infusionsoft it must be good! What would these instances be? If your client is not ready for the development-bandwidth needed for Infusionsoft, building out their sales and marketing funnels (or their entire website) is going to be a lot easier using Click Funnels. What Click Funnels lacks in robustness (when compared to Campaign Builder), it makes up for in clean, drag & drop functionality. As great as Infusionsoft is, sometimes you just have to call a spade a spade; it seriously lacks in the aesthetics department. 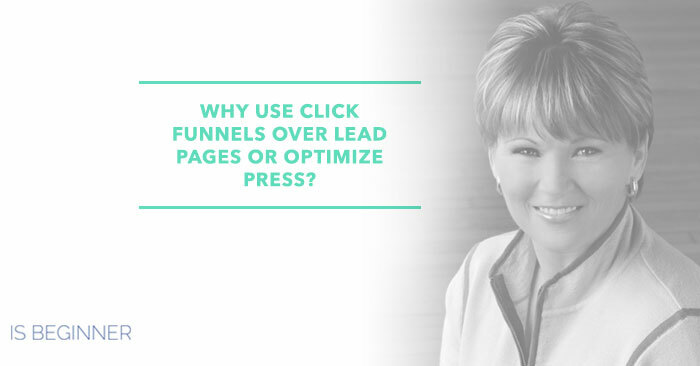 The truth is, Infusionsoft does not make pretty pages but Click Funnels does. Five years ago, businesses could get away with having an unattractive site but in the today’s digital marketpalce a sharp, clean and streamlined look is key. A great UI and UX are usually the difference between paltry and sizeable conversion numbers. A couple of weeks ago, we used Click Funnels for the first time to run the registration portal for the Mastery Class webinar. Not only did Click Funnels drive a conversion percentage of roughly 80%, but three separate registrants emailed me directly to say how much they loved the registration process – that has never happened before. Click Funnels is mobile responsive, Infusionsoft is not. With the increasing prevalence of mobile device usage, this fun fact speaks for itself. When working with Infusionsoft, anytime you hit a roadblock you’re going to need the outside help of a whiz-developer or an Infusionsoft-pro like The API Guys. The basic Start-Up package with Click Funnels comes with full and fanatical tech-support, a really, really nice bonus if you are lacking supplemental IT budget.